From the three new inmates, Suja started earning Bigg Boss Tamil audience hearts by telling her life story after her first Sunday inside the house. She felt very hard because of her unsuccessful in her career wise. But she is happy about her life because of her mother and sister. She already shared few things with Snehan and Vaiyapuri about her cinema life and personal life. Then, Harish also shared few things, not much like Suja. He wants to be kind with other inmates in the house and also he likes to compete with others to win the title in a good manner. Also, he mentioned Vaiyapuri’s name as one of the honest man who living with other inmates in the Bigg Boss Tamil House. After this session, Snehan predicted that Suja is performing like Oviya. While the audience also having the same thought is notable. He also added few more that she can’t be like that for long if she acting like Oviya. Her own blood will out some day if she is acting at present. In other side, Raiza mesmerizing about Suja’s cleaning work to Kaajal. But she doesn’t know that she is the one in her house was done all the things in alone. Arav felt sad about the eviction of Shakthi, he said that he cried after long years for Shakthi. Also he accepted that he didn’t felt hard for Shakthi’s eviction when to compare with Oviya on Audience question on Saturday’s question. Kaajal told to Raiza that she is thinking ‘Snehan having crush on You.’ By seeing many scenes, Raiza paired up with Kaajal after Gayathri’s eviction. In other corner, Snehan felt bad about Gayathri’s final words to him as negative. Nomination Process: During the nomination process, Raiza gathered maximum of names. Then Snehan is the second one who need to go out from the Bigg Boss Tamil House. And his dearest inmate, Vaiyapuri selected as third. Open Google search on your mobile or computer. 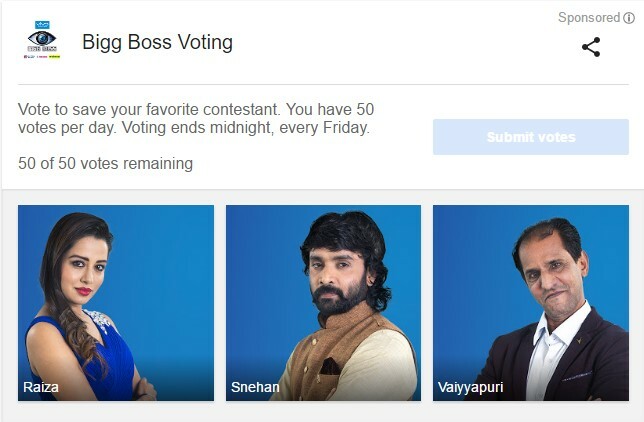 Type as “Bigg Boss Vote” in the Google search. If you had good internet connection, you can see the nomination names with their images (see the screen-shot which given below). Or else you can see only the names of the nominations because of the slow internet connectivity. From that list, mark your votes count for your favorites to save.